Choosing a holiday that will be suitable for both pets and children will take some planning, but it is not by any means an impossible task. There are many options for families bringing pets and kids on holiday, though they may take a little sleuthing to find. If you are looking for a holiday for the whole family, think hard about what you’ll need to keep your pets and kids happy and safe, and then begin your hunt to find the perfect location to make all of these dreams come true. Travelling with pets can put some limitations on your potential destinations. To begin with, you’ll need to know how you plan to travel and if your desired transportation will allow pets on board. You’ll also need to know if foreign animals need to be quarantined at a desired destination or if your pet will need specific tests or injections before travelling. If you find that you can travel with your pet, then you need to think about what you will need for your animal once you are in your holiday location. 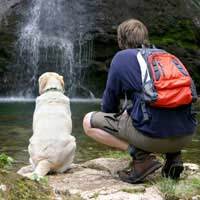 How, where and what to feed your pet, if there will be spaces for walking or otherwise exercising your pet, and how your pet can be supervised if you would like time without him or her (such as an evening or meal out) are also important considerations when attempting to plan a holiday with a pet. Travelling with kids also requires some pre-planning. To begin with, you’ll want to make sure that you are considering only holiday destinations known for family fun and safety. Next you’ll want to determine exactly which facilities and services your kids will need. If you are travelling with a baby then things such as feeding facilities and the availability of nappies, formulas, bottles, nap areas and more will become important in your plans. Determining how many rooms, what types of beds, and which methods of transportation you’d like to take will also need to be factored into your ultimate decision. You’ll want to look into the availability of babysitters, health care services, day trips and restaurants catering to children if these things are necessary to your holiday happiness as well. Once you know what you need to keep your pets and children safe and happy while on holiday you can begin to investigate your options. Booking a package holiday will be the simplest – if you can find a package that suits – as it means that a travel agency will arrange all of the details including transportation, transfers, rooms and often food. If you prefer to book all of these items separately you may be able to find lower prices but you should be aware that you may need to spend more time with your investigations. Choosing a pet and child friendly holiday requires a great deal of forethought, but once you are clear on your wants and needs you’ll be able to pick something that suits your family down to the ground. Just be sure to pack your camera!